Coast Artillery existed as a distinct branch within the Army since 1901 and as a combatant “line” arm after 1920. Its stated mission was to protect fleet bases, defeat naval and air attacks against cities and harbors, undertake beach defense while acting as army or theater reserve artillery, and provide a mine-planter service. Prior to the war, Oʻahu defenses were divided between Pearl Harbor and Honolulu Harbor; however, with more military facilities being constructed on the island, the coastal defense program also expanded. In 1940, the Navy decided to acquire all of Mōkapu Peninsula to expand Naval Air Station Kāneʻohe, a sea plane base it had started building in September 1939 and would commission on February 15, 1941. Between 1939 and 1943, large sections of Kāneʻohe Bay were dredged for the dual purposes of deepening the channel for a sea plane runway and extending the western coastline of the peninsula with 280-acres of coral fill. With the development of Kāneʻohe Bay into a major naval air base, there was a need for additional coastal defense in that area. Eventually, Kāneʻohe Bay was protected by three battery installations. Two were built on the installation and the third was built at Lae-o-Ka-Oio, in the vicinity of what we now call Kualoa Ranch. In about 1944, construction project ‘302’ was started for Kaneohe’s 3rd battery. It had two 6-inch guns, built at the northern reaches of Kāneʻohe Bay. Local engineers modified the conventional plans to fit local geographic conditions. The battery was not named until after the end of the war (it was later named, Battery Cooper (after Avery J Cooper)) and it served for about 5-years as part of the World War II-era coastal defense program. The site was fit for tunneling – it had soft volcanic rock and with the rugged terrain, it was decided to tunnel, rather than cut and cover the gun emplacement. The tunneling provided a better-protected and lower-cost alternative compared to the cut and cover traditional construction. The battery was built into the face of the cliff and had concrete-lined tunnels leading to the gun positions. The tunnels led back 150-feet into the cliff and had rooms off of the 45-degree tunnels for magazine and support facilities. The battery commander’s station and radar room were 75-feet above the gun level. This was connected internally by stairs in a narrow shaft. It wasn’t the only military facility in the vicinity. On the level land below the cliff and extending to what we now refer to a Kualoa Beach Park was the Air Force’s Kualoa Airfield. The Kualoa Airfield was operational from about 1942 to as late as 1947. It had a single 6,500′ (north-south) runway formed of pierced steel planking. A row of revetments for protected aircraft parking was along the west side of the runway near the cliff. 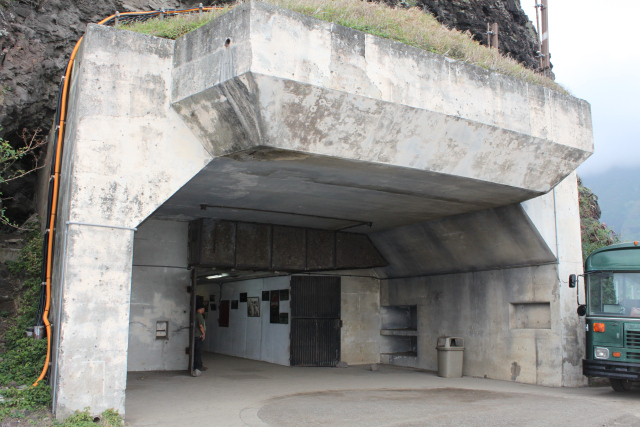 Although no longer used for military defenses, Battery Cooper is being used as a movie museum about films that have shot scenes in Kaʻaʻawa Valley. The image shows the gun emplacement area and entrance into Battery Cooper. In addition, I have added other related images in a folder of like name in the Photos section on my Facebook and Google+ pages.